A free-standing unit with wireless backhaul which can be placed on window sills, tables and shelves. It supports LTE-A (FDD or TDD) and an optional WiFi AP (802.11n concurrent with 802.11ac). 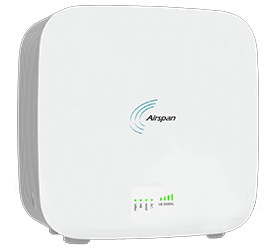 AirDensity is composed of an eNB for access, and a standard high-performance UE relay for wireless backhaul. The LTE users inside the Enterprise premises connect to AirDensity on frequency band “f1” (FDD or TDD). For backhaul, AirDensity connects to the Donor eNB cell on band “f2” (FDD or TDD) and is secured by an IPSeC tunnel, in addition, backhaul does not need to connect to the enterprise network (LAN). Automatically self-install and self-configure for rapid deployment. AirDensity reduces costs by eliminating the need for local backhaul infrastructure and installations. Desktop and wall mountings increase deployment options. Improves Macro network utilization by improving user links.